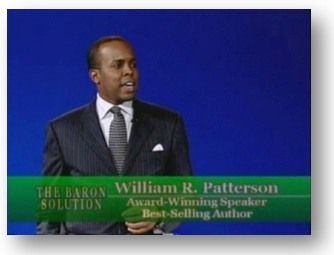 William R. Patterson is a four-time award-winning lecturer, international best-selling author, and management consultant who uses his trademark approach, THE BARON SOLUTION™, to coach, train, and motivate business leaders, sales professionals, entrepreneurs, and investors. William has shared the stage with billionaires, presidential candidates, and Fortune 100 CEOs. His breakthrough book, The Baron Son, has been translated around the world and featured in the Forbes Book Club. William is a regular business and financial expert for networks such as CBS and SiriusXM Radio. He has been a featured guest on over 1,000 television and radio programs. William was named a "Top 20 Business Icon" by Exceptional People Magazine and Entrepreneur of the Year by African American Lifestyle Magazine. He is also winner of over twelve Web awards for excellence including: Best Wealth-Building Site; Best Business Advice & Development Site; Best Male Author; and Best Speaker and Lecturer. His wins are the result of 650,000 votes cast from over 130 countries. William is an internationally recognized business coach who has dedicated over a decade to researching peak performers and created a model for learners who want to balance the demands of personal life with the pursuit of professional success. Whether you are arranging an event for business leaders, sales professionals, entrepreneurs, or investors, William's insight will equip and inspire attendees to take meaningful action. "Remarkable—a challenging and satisfying guide to success through inspired strategic leadership." "A breakthrough approach in relating leadership principles that have long served those in commanding roles." "Everyone can benefit from this roadmap." "Great for the MBA students who are preparing to run America`s corporations." "A must for those who are truly interested in improving their financial position." "Offers fundamental and understandable strategies for creating successful business executives and building wealth." — Arnold S. Goldstein, J.D., LL.M., Ph.D.
"Truly enlightening and inspirational for anyone at any level." "One of the most effective methodologies I have encountered for developing self-mastery." the ethical road map to wealth, power and success.